I came across two new beer videos this week. Both are really good and worthy of your attention. The only thing missing here is "and they only joined because we gave them Wetherspoon vouchers !" Earlier in the summer, I was chosen as one of the JP volunteer curators of this year's Koestler Trust annual exhibition showcasing Art by Offenders. Each year the Koestler Trust hosts an awards competition of visual arts, film, music and writing by prisoners and others in secure settings. This year the competition attracted entries from UK prisons, secure hospitals, immigration detention centres, youth offending services, probation and British prisoners serving overseas. The total entry was over 7,000 pieces. My part in the process was to spend three weeks selecting about 150 pieces worthy of display from a total entry of visual arts of about 5,000. It was a real test of group decision making and selection by committee but I am really proud of the end result which is now available for all to see. Please drop in for a few minutes if you are passing through Central London or make a special visit. I know I am a bit biased but I guarantee you will be glad that you did. If anyone would like me to join their visit to give a curator's perspective, let me know. I would be glad to come if my diary is free - daytime or evenings. Finally, I can't resist putting a beer spin on this : Meantime bottles are available at the Royal Festival Hall bars and the Harp, CAMRA's national pub of the year is about a fifteen minute walk across the river. There is also a pretty good pub walk to be done nowadays along the Strand. The National Honey Show will again be held at St George's College, Weybridge on 27th-29th October. There are over two hundred judging categories in the show from Jars of Honey (2) to Beeswax Candles (3) to Mead (Dry) and Honey Fruit Cake. For the last two years I have been one of the judges in the Honey Beer category and my reason for this post is to invite more brewers (and now home brewers) to consider entering the competition. Each year the competition has attracted between six and eight entries, so there is an excellent chance of scooping the Leslie Thorne Trophy. The only criteria for entry to the beer category (class 41) is that the beer shall be commercially available and honey must be an ingredient. The entry is 3 bottles or cans and the fee is £20. This year there is a new class for home and non-commercial brewers (class 42), Honey beer, any style, 2 bottles, minimum 330ml, not commercially available. Honey must be an ingredient. Entry fee is 50p. The committee at the National Honey show are all lovely people, as passionate about beekeeping as we are about beer. They would be delighted to increase the number of entries to further justify their inclusion of a (honey) beer category. 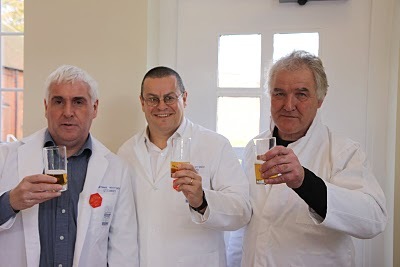 My fellow judges, John Porter (left) and Tim Hampson (right) will also be delighted if the number of beers to taste increases ! Melissa Cole is the fourth judge which is rather apt as Mel is the latin word for honey. This evening looks like it will be a lot of fun with our favourite beer-world double act. The Red Lion is a traditional Fullers pub in Barnes, SW13 with a great reputation for both beer and food. I can't miss this and my tickets are already secured. There is likely to be strong demand, so I suggest you reserve tickets soon if you wish to come along. The Red Lion is on the bus route between Barnes and Hammersmith so both those stations are easily accessible. I'm going to walk ! Two local beer experts will be going head to head at The Red Lion in Barnes to persuade foodie customers who is the best beer matcher of them all. 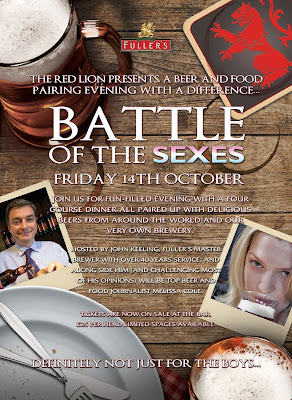 Leading beer writer Melissa Cole and Chiswick brewery Fuller’s Head Brewer John Keeling have been challenged by The Red Lion’s managers Angus Mckean & Claire Morgan to match beers to a specially created menu. Both choices will then be served on the night with customers voting on their favourite match. Neither John nor Melissa will be aware of the other’s choices. The ‘Battle of the Sexes’ event, designed provocatively to ‘find out who has the most taste – men or women’ will take place on Friday October 14th. Angus and Melissa have put together a mouth-watering (and belt-busting) six course menu including oysters steeped in Belgian lambic beer (made with wild yeasts), sweet potato and yam baskets with slow roast pork belly in plum sauce and pear tarte tatin with homemade Fuller’s Past Masters Double Stout ice cream. You’ll have to buy a ticket to find out the beer matches suggested by John and Melissa. Last week I was lucky enough to be asked to join a media trip to Sharp's Brewery in North Cornwall, the home of Doom Bar, to see the progress and ambitions since the company was taken over by Molson Coors for c£20m some seven months ago. Pasties taste best in Cornwall - especially after a seven hour journey. The takeover of Sharp's by Molson Coors (MC) is a "marriage of two businesses with similar values". Beer volumes are growing. Projected production in the coming year is > 120,000 barrels - of which only 3,000 is in bottle. More than 90% of this is Doom Bar. Only 18% of regular cask ale drinkers drink solely cask ale. MC are investing £5.7 million in Sharp's over the next 2.5 years. Rock, Cornwall is in the back of beyond, on the north Cornwall coast, across the bay from Padstow and a half hour taxi ride from Bodmin station. There is no suggestion in even the longer 10 year business plans that brewing will move away from Rock. Sharp's use more whole hops than any other UK brewery. Doom Bar is the third best selling cask ale in London, the top in the south West and fifth nationwide : after GK IPA, London Pride, Deuchars IPA and GK Abbot. The investment over the next two years will support growth of Doom Bar outside its heartlands of London and the South West. 52 % of cask ale drinkers drink wine as preference at home. Doom bar is sold in 3,200 pubs. Cask ale drinkers are the most promiscuous. Doom Bar is "gloriously mainstream"
55% of people cannot detect lightstruck flavours that will often come from beer in clear bottles, 35% actually prefer the light struck flavours. (See also Shepherd Neame, Badger and the iconic Newcastle Brown). The clear bottle is modern and contemporary and supports the brand image. Lager drinkers prefer clear bottles. (See also Corona and Sol). Brewers prefer beer in brown bottles. People mature to cask ale at an average age of 45 but usually convert from other beers and have come to the beer category at 18-24 remaining loyal. There are now a huge number of 18-24s who are missing the beer category completely due to the growth in cider and spirits. They are much harder to get back. The beer category includes Carling, MC's major UK brand. The implication being that MC are massive supporters of "beer". Stuart Howe's trial brew plant is 60 litres NOT 60 barrels as his tongue slipped(and probably wished for). The takeover has meant that he is now head brewer in a brewery investing for future growth rather than a brewery being fattened up for sale. Part of Doom Bar's success is the fact that it is easy for licensees to condition. The beer has a low yeast concentration, 4m cells per mil in conditioning tank, 1m cells per mil in cask. This means most of the conditioning is done in the brewery and the beer drops bright, ready for the customer, within 12 hours of reaching the pub. No maize, rice or sugar is used in the brewing process. That was the more formal stuff. We were then treated to a swift brewery tour after which the beers started to be poured. This is where it all started to get a bit messy. to collectively influence the future of the Campaign at a national level. and increasing the involvement of grassroots members in strategic planning. 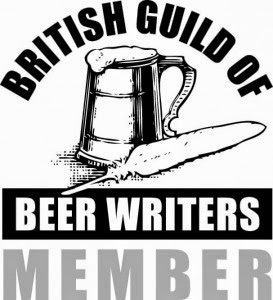 The text of the full report is available on the CAMRA website. redress the balance between the pub and the supermarkets. detriment of cask-conditioned ale? Is customer choice being reduced? to accommodate lovingly crafted neo-fizz? Campaigning aspirations and audiences - are we preaching to the converted? prices. Lunch will also be on sale. The bar is open well into the evening. The premises are fully accessible for wheelchair users. 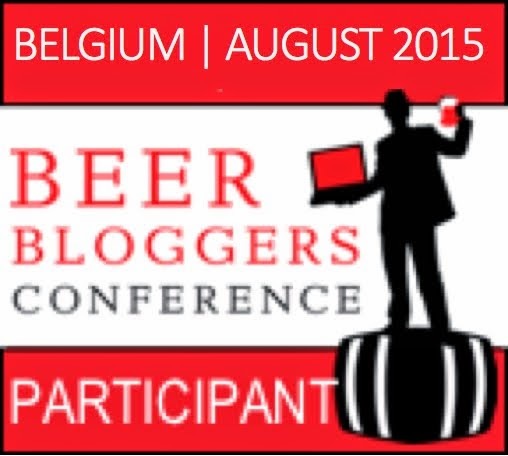 invited to participate by joining CAMRA on the day. I look forward to seeing you on Saturday!